In 1984 my wife Charlene was diagnosed with an hemangioblastoma, a tumor of the blood vessels in her brain. The tumor had been growing since her birth and had grown to such a size that it was about to burst, an event that would have killed her. It was by chance that Charlene's cancer was diagnosed and it was again by chance that she got the best treatment possible at Massachusetts General Hospital in Boston. The good luck continued through her operation when she had to be moved during the middle of her operation because her blood pressure dropped. As a result, her operation took 13 hours instead of the scheduled 8 hours. Finally our good fortune extended to her recovery when it was found, beyond all expectations, she had no long term deficits. We were truly blessed beyond belief. There were many people praying for Charlene during her operation and recovery and there is no doubt in my mind that their prayers played a key role in the good fortune that came our way. The operation happened just before Christmas and it turned out to be the best Christmas ever for our family that included our young children Mathew and Heather. I knew in my heart we had truly been blessed by the grace of God. The next year, I looked for a book telling the story of the birth of Jesus to read to my children. I wanted them to learn the real story of Christmas and not just focus on all the trappings of Christmas such as Santa Claus. I wanted to bring Christ into our family celebration. I was disappointed in what I found. There were loads of books about Santa but few about the birth of Jesus. Most of those books were too juvenile or had cartoon-like characters. I was amazed that one of the greatest and best loved stories of all time should be so poorly represented. An idea slowly emerged that I needed to write this story. I needed to write a book that would appeal to children and adults alike, a book that families could share at Christmas. The book needed to be like The Night Before Christmas, a book that families would cherish from generation to generation. I decided the story should be in rhyming verse for poetry seems to touch people's hearts and souls. An idea came to mind that the narrator should be a donkey, a donkey named Zeke, a good old fashioned, Old Testament name. And that's how my book First Christmas began and almost finished. I had never written poetry before and every year I would pull out my project and write a few more lines. It was a bit of a family joke as the kids would laugh, "Dad's writing his poem again!" Yes, it took me almost 20 years to write the poem, a true labor of love. As all authors discover it is one thing to write a book, it is quite another thing to get it published. Rejection, rejection, rejection!! People liked my poem but no-one wanted to publish it. Poems are a strange genre that few publishers want to consider and religious books are even less attractive. Not only that, my book was a seasonal book with a limited life span. But something told me this book needed to be published. So I broke the primary rule of children's book publishing and began looking for an illustrator, a task that publishers strictly reserve for themselves. My daughter is an artist and she tried some test drawings of Zeke the donkey but they ended up too cartooney. I was looking for illustrations that would add dignity to the story. There is something about this image that really attracted me. On the one hand it has a simplicity and folk art feel to it. On the other hand it feels genuine and true to the story. I knew the colors would appeal to children. I went to the website and discovered that the artist was Adel Nassief, a Coptic Christian artist who lives and works in Alexandria, Egypt. 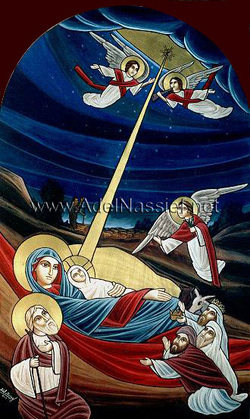 I contacted him by email and several weeks later he had agreed to paint 21 pictures for my book in the style of Coptic icons. I gave him a copy of my poem, and described to him what I wanted in the pictures. He would email me a picture of his sketch which I would then approve. Our contact was solely by email. Adel is a busy artist and it took almost 2 years for him to complete the 21 pictures (you can see them here). When he finished, a colleague happened to be sending artwork to a Dallas Coptic church and my shipment was sent in the same container. What a great coincidence! I took the pictures to Steve Beasley, a photographer in Dallas who specializes in the photography of fine art. The pictures had gold leaf in them he was doubtful that he could do a good job because of the reflection. He worked on the job over the weekend and much to his surprise the photographs turned out beyond his expectations. In fact he was absolutely amazed at the results. I had the photographs scanned and made up a mock up book using Powerpoint and started circulating my book to publishers. Once again it received a universal rejection, rejection rejection!! Undetered I decided to look into self publishing and discovered a category of publisher called "book packagers" who design and create books for writers. One book packager who I really liked was Welcome Books, a New York based publisher of quality illustrated books. I sent my mock up to them and then heard nothing. In 2006 I was returning from a vacation through New York. The hotel we were staying at was about a block from Welcome Book's offices so on a Friday afternoon I called them up and the phone was answered by Lena Tabori, one of the Principals of Welcome Books. Lena is well known in the book business and at one time was the Tabori in Stewart, Tabori & Chang, a renown publisher of illustrated books best known for publishing Martha Stewart's books. She was alone in the office but had 30 minutes before her next meeting and invited me over. Her next meeting was with Sam Fink, a sprightly 90 year-old and artist who had published a number of books with Welcome Books including a children's version of The Constitution of the United States. Lena gave him my book to look at and Sam who is Jewish declared that he found my book very moving. With Sam's approval, Lena agreed to design and package my book. Welcome Books and their staff, Clark Wakabayashi and Natasha Tabori Fried did a marvelous job of designing the book. It is a hard cover book with a wonderful red cloth cover. The lettering on the front of the book is in engraved gold and one of Adel's pictures is 'tipped' into the cover. It is a very striking cover. Inside the book is just as impressive. The printing is in 5 color rather than the usual 4 color ink printing. The extra color is gold and the production value of the printing is outstanding. I also arranged to have the book translated into Spanish by Yanitzia Canetti who managed to translate it into Spanish verse. In 2008 the books were published and in a moment of 'irrational exuberance' I decided to print 20,000 of First Christmas and 5,000 copies of Primera Navidad. Christmas 2008 turned out to be the worst Christmas ever for book publishers. The economy had tanked and book publishing was under attack by new digital technology that promised to make books obsolete. Welcome Books helped me to publicize the book and I hired a Christian publicist for the Christian media. It was all to no avail. In the end I sold just over 4,000 books, not bad for that market but well below my expectations. In the post mortem following Christmas I started to realize that my heart had been in the wrong place. Throughout the creation of the book I had put aside my ego and quietly followed the pathway that opened to me. But once the book had been created I started to become self-important and force the path rather than be patient and allow all things to happen in God's time. In 2009 I tested an idea that had been developing in my mind, to turn the book into a fund raiser for charities. In Bermuda, my home, I tried this out with my church and another Christian charity with some success. In 2010 I am rolling this idea out to Dallas where we have a second home. I have a wonderful resource of 20,000 books that can be sold at a premium by charities. I am only interested in getting back a small portion of the funds that I have invested in this project. If I can raise $500,000 for worthy charities in Dallas then all my effort will be more than worth it. And in the process, maybe Zeke's story will touch people's hearts and make Jesus a more important part of our Christmas celebration.